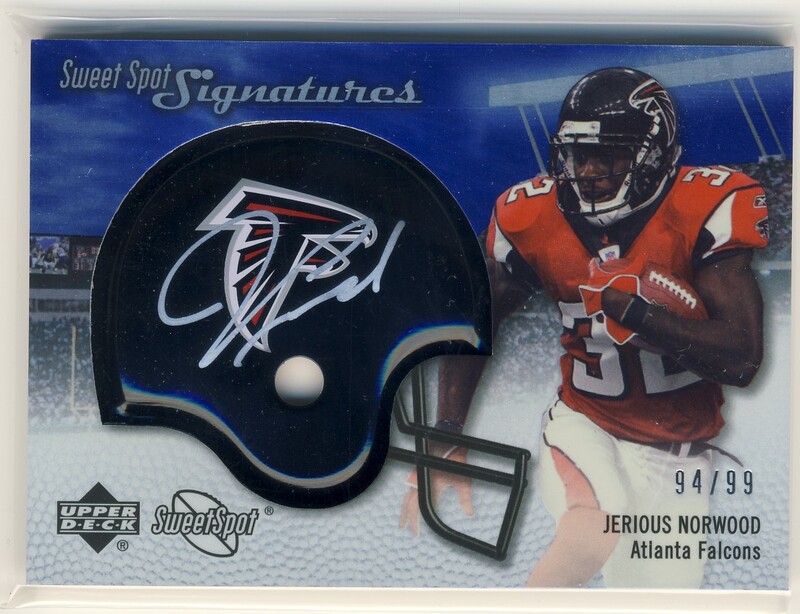 Jerious Norwood might not be playing in today's game [he's been out since Week #2 with a knee injury] but I figure you might be interested in a Sweet Spot autograph of his. To win this card, leave a comment on this post telling me what your favorite card set is [any sport will do]. Be sure to enter before the end of the game and then I'll take all the answers and do a randomization. The winner will be the answer that comes up in position #7. Man, Seven is my lucky number! !Actually, my favorite set is the Mascots subset from 2010 Topps Opening day. 1964-65 Topps Tall Boy hockey set. Im not sure if you mean this year or ever. If you mean this year, it's Chicle. I love paintings and this set is a beauty. The paintings are (for the most part) spectacular, and I can't get enough. Ever would be UD Masterpieces in 2008. The canvas feel is my favorite, and I don't care if I have the whole set, I buy boxes over and over. It's so addictive! I've got two Norwood autos already so I'll jump in at #6. 1953 Topps. Best set ever. 1990 Fleer. I just wish I could find some unopened product. Suggestions? Anything Allen and Ginter! Vintage or not! Give me 2008 Absolute football, I really like those RPMs from my favorite rookie class.